Checking your engine with a vacuum guage can tell you a lot about an engine's condition. 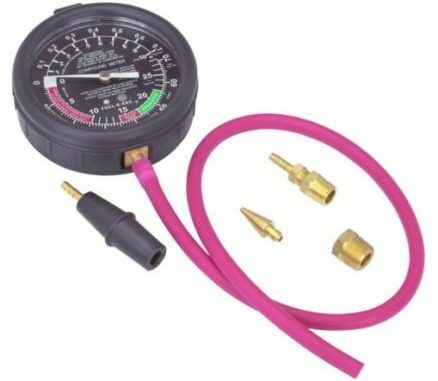 Checking your engine with a vacuum gauge can tell you a lot about an engine’s condition. This is similar to doing a cylinder leak down test – but in a much easier way. In just 3-5 minutes you can know if an engine is healthy or not. Vacuum gauges are often forgotten in this age of OBDII scanners and other specialized tools, but a vacuum gauge can VERY quickly tell you whether or not your engine is good, or needing repairs. Periodically checking your engines vacuum will help you learn how your engine is doing. 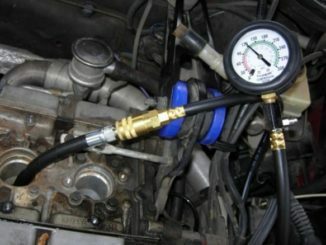 To check an engine with a vacuum gauge, all you need is a vacuum gauge and a bit of vacuum hose. Vacuum Gauge-To test the engine, start it and let it reach full operating temperature. Then simply connect your vacuum gauge to an empty vacuum port on the intake manifold (anywhere PAST the throttle body). You may need to T a vacuum line, which may or may not have come in your kit. 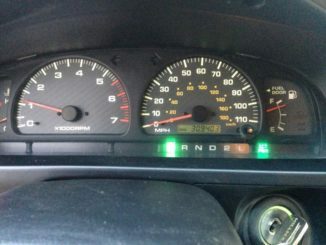 Once you’ve connected the gauge you should see a STEADY reading at idle with the throttle closed. That reading should be between 17 and 22 inches of Mg (mercury). If you’re at altitude, these readings may be lower (supposedly by 1 inch of mercury for each 1000ft above sea level, roughly). A low vacuum reading means you have poor piston rings or oil rings. You may also note lower vacuum readings when running high overlap camshafts or changed camshaft timing. If the engine passes that test then snap the throttle open and closed again. Doing this quickly should reveal a vacuum drop to perhaps 0-3 or so and then it should snap back to 25 before settling back to 17-22 again. This means the valves and rings are OK. Snapping the throttle and getting a drop to 0 and then a climb to only say 20-22 will possibly indicate worn rings. Basically, if it only snaps to about where it was or just a hair above, you may be dealing with worn piston rings. It should snap temporarily higher (3-4 inches or so) and then settle back. Can be spotted by seeing a vacuum reading that occasionally drops from normal by about 4 inches of mercury. Will behave the same as a sticky valve, but will drop much more, say 6 inches of mercury (and then return back to normal, in a cycle). Can be detected by a vacuum reading that vibrates back and forth between 14 and 19 or so very quickly. 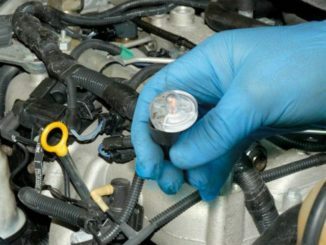 If you suspect weak valve springs, rev the engine to say 4000 rpm and see if the needle swings back and forth rapidly. Then raise the revs to 5000 or even 6000 rpm, if your valve springs are weak, you’ll see the swinging get wider as revs increase. Would be indicated by a low reading of say 5 inches of mercury or so. Though, a very low reading can be caused by extremely advanced ignition timing or incorrect camshaft timing as well. 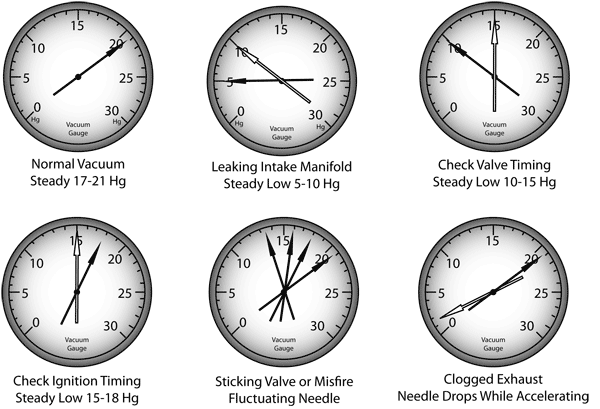 Issues can be found by seeing a floating needle between 5 and 19 inches of mercury. This could also be caused by a intake manifold gasket leak or a faulty injector. You can check the oil for coolant if you see this behavior however (and vice versa) to confirm your diagnosis. Oil can be tested for coolant since it’ll be impossible to see in it. Behavior such as a vacuum indication that shows a slow movement between various readings could mean a leak in the intake manifold, bad idle air/fuel ratio, or perhaps a clogged PCV system. Checking your engine with a vacuum guage is still the fastest test. While vacuum gauge readings do not necessarily tell you with 100% certainty what the problem is, they will tip you off that something certainly is wrong.